Summer and music can very easily go hand in hand. 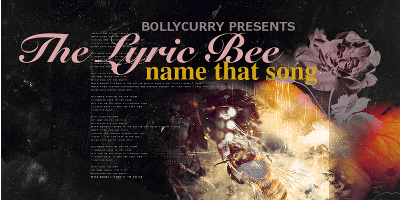 For July's edition of the popular Lyric Bee quiz, BollyCurry brings to you three feature songs that are perfect to turn up when the nights are boring, and the heart is racing - for a party! For the newcomers, we have translated three Bollywood songs into English and posted them below for you. Your job is to figure out what the title of the songs are and which movie they are from! My sleep has also become disturbed, I'm flying all night long"
I'm immersed in my devotion to Lord Hanuman"
"You do what I do, why should there be any shame? I've seen it, I've heard about it, this matter of love"
Good job to those who got it right! With that, we bid adieu while you post your answers in the comments below! Here's a big applause to all the readers that will get it right in advance. Put those thinking hats on and keep the Bollywood IQ on the ready, for it will be needed. Until next time, see ya later alligator! Editor[s]: Tanisha N. and Gunia K.
'Ki and Ka' shows genders don't matter: R. Balki Contest of the Week: Test your BollyQ!